First and foremost, thank you all for your interest in our beer! 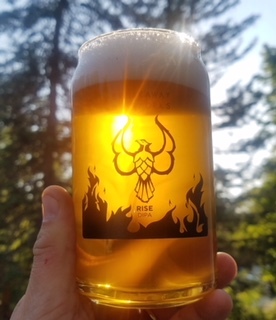 I have a list of places to find RISE our first release of Double IPA. Please contact the vendor directly for confirmation of receipt and availability and thank you as well to the retailers and Craft Beer Guild NH for getting it out there so quickly! We're heading towards the finish line! Beer is almost here! Specifically speaking RISE will be canned and kegged Next week on 5/21. I have been answering a lot of emails and social media inquiries as to where our beer will be available. We have signed on with Craft Beer Guild Distributing of NH. As things begin to move along, the easiest way to find our beer will be to visit their website craft beer guild nh. You can also follow them on Facebook https://www.facebook.com/craftNH/ Instagram https://www.instagram.com/craftbeernh/ and even on Twitter CraftBeerNH. With our first brew day behind us we are barreling forward to brew day number two. This time we will be brewing CITRA FUSION Pale Ale. CITRA FUSION has a lower ABV and IBU level than a double IPA or even an IPA, yet it is loaded with hop flavor and aroma. This is an easy beer to crush with no loss of hoppy deliciousness. CITRA FUSION is a medley of citrus and tropical fruit flavors. Thirst quenching fruit salad without the actual fruit. Labels, stickers, and tap handles, oh my! !